Welcome back. I hope you are well rested. 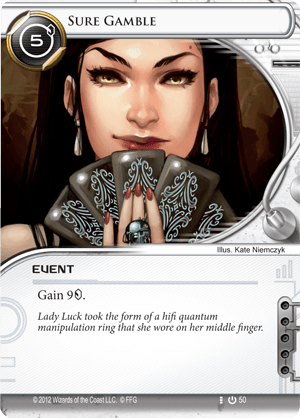 Today we dive deeper into the mechanisms of Netrunner, in the first of a complementary series of articles aimed at exploring in detail the four skills of Netrunner as defined in the leading article. 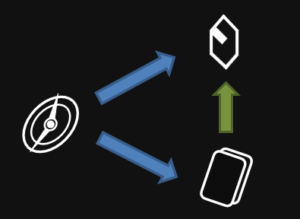 The theme of these articles will be in-depth discussion about what should guide your actions in the game, and how to properly evaluate the game-state as well as to know what actions to take when. This series is aimed at intermediate players who want to find out how to improve. How to recognize the mistakes you are still making, and how to correct them. For the sake of this I will assume that you are well-versed in the rules of the game, and have knowledge of the cardpool. If you are just starting Netrunner you will be well-served to concentrate on learning the basics (rules, cards, your decks) and revisiting these articles after that, as they will likely be of bigger value to you then. First up: Efficiency, how to properly evaluate your actions in regard to the economy of the game. This is the base economy of the game. Each side has clicks to spend on doing actions or improving their economy. A click can always be converted to a credit, or a card. Credits are needed to take more powerful actions and use cards. Cards give access to powerful actions. This is the central mechanism that allows you to take powerful actions, and that is a large factor in winning games. Specifically that you get more and more powerful actions than your opponent, on average. This is the most powerful concept we will look at and is called tempo advantage. The term tempo in games is defined as ‘who is forcing the opponent to act’. In other words, ‘who has the ball’. More on this in the article on Tactics but simply know that one way to gain tempo is to consistently be more efficient than your opponent. This will force them to take risks in order to prevent eventually losing. This is what can be considered ‘burst economy’ and is simply a way in which cards allow you access to credits at a better rate than normal (Sure Gamble). Cards can do lots of things, of course, like allow you to draw more cards (Diesel) or give you clicks (Amped Up). Some decks are satisfied with this type of economy, but most decks want permanent access to a better economy. They invest in different types of boardstate which is a term for permanent effects. This can upgrade your basic actions (Magnum Opus), allow you economy without spending clicks, so called ‘drip economy’ (PAD Campaign, Aesops Pawnshop, Beth Kilrain-Chang). This is obviously powerful since it gives you more resources over time than the base-economy. A few things can be learned from all this. The first is that clicks are superior to cards and credits (worth more) since they can be freely converted to both. Second, that cards in the game are a more powerful way of acquiring credits, thus cards are in some sense superior to credits. This means that if you treat clicks as credits too often you will be falling behind in economy, which is usually inefficient. Since you want to prevent this you need to include a good set of economy options in your deck. Now before we use what we learnt to go into deck construction I am going to tell you a secret. There is an invisible economy that is not immediately obvious. With this I mean that there are resources that you are trading and spending that affects your game, but you may not think about as they are not immediately apparent. These resources will heavily affect your tactical play once we get there, and is a hybrid between tactics and efficiency. One term you already know, tempo. Tempo is important because it decides who needs to act and who can dictate the game. I would like to coin a term for another rather subtle part of your economy, but one that increases in importance as you become better at the game: deck access. Deck access means that you have access to more or less of the cards you put into your deck, it is the percentage of cards from your deck that you have seen. It starts with the five cards you draw as your starting hand, and increases during the game as you draw cards. Note that this differs from simply ‘cards’ as it is never going down. It is the information you have about your current options (in your hand, on the board, in the heap/archives) together with the information about what is left in your deck. This greatly affects the value of the ‘draw’ action depending on what you need. By this measure a card like ‘Sure Gamble’ not only gives you 4 credits, it also gives you one ‘deck access’. Limiting your economy to drip-economy does not have this hidden benefit. While playing, unless you continually increase your deck-access by drawing cards your options in the game will be limited by the randomness of your drawn cards. Your options are what you currently have avalable (in your hand and boardstate). Note that this value (the number of cards you’ve seen from your deck) is only going up, and to get access to many important cards you will need to work away at it. Many important cards are singletons, and to maximize your consistency you need to make them easy to get when you want them. In short, drawns are more valuable in the beginning of the game because they increase your options when needed and permanenly increase your deck-access, reducing the variance of your deck. You never increase your deck-access or options. This will put you behind. Thus, having a bad economy not only costs you in terms of efficiency, it costs you in terms of options for tactical play. What does this mean for your deck? Take the simplest example of a deck economy: Burst economy. This means your only access to efficient credits is by playing one-time burst-economy cards. Since you want to get as much efficient economy as possible you have to make sure that your draws give you this. Thus, you need to put enough cards in there that you rarely or never have to click for credits! Another serious advantage with burst economy is that it is very difficult for your opponent to deny. What are the downsides? Well, using purely burst-economy costs you more deckslots than any other option. Since you never establish a better permanent economy you will need to continue drawing cards, and you will run out of steam if you stop. This means you are locked into drawing cards simply to get money. The consequences of this are that card-draw is of higher value at the start of the game, when it gives you both options and economy. It only gets worse as the game goes on as you set up your rig and find your tools. At the end you will simply be drawing all your duplicates together with the economy. No bueno. Next up we look at the other extreme: click economy. This means that you improve your boardstate so that your basic action of clicking for a credit is improved. The golden standard for this being Magnum Opus. Using this card you double the efficiency of your basic ‘click for credits’ action. Whoa! Overpowered, right? 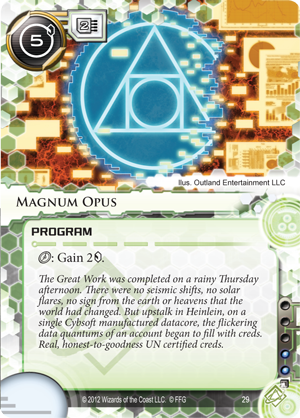 While Opus is the extreme example of permanent click-economy and a very solid card the things you give up are less obvious. Sure, it costs you 2 memory and requires support to get more memory, but most importantly it costs you deck access. While sitting there clicking credits you never improve your set of options, and you are stuck with what you currently have. This means that Opus is perfect once you have your rig set up, but is a dangerous tradeoff in the early game. Also, if the opponent can disrupt your boardstate you will feel the pain. Against some opponents this type of economy makes you vulnerable. We have one more to go, and it is everyone’s favourite: Drip economy. These are the boardstate-options that give you a continuous income stream that do not cost clicks. A good example is PAD Campaign, or Underworld Contacts for the runner. These cards are good because they give you a permanent boost while costing you very little. If established early they can give you a lot of credits over a single game. They also free you up to use all of your clicks for tactical gains instead of economy. In reality, they do cost you time. It often takes time before they pay off, and installing them may require combos or put you at a tempo disadvantage. They are often also easier to disrupt and destroy, often being resources or assets. They are best installed early for maximum benefit. Additionally, since they are balanced to give benefit over time they are vulnerable to inconsistency if you do not find them early. If you find them late they might not be worth the install. Now we get to the real meat of this article. We will look at how to evaluate the efficiency of your actions. The biases and cognitive illusions of doing this improperly is something I continually see players fall victim to, including experienced players. Once you have your deck, getting better at efficiency as a player is all about what you do within the game. To do this you need to properly evaluate how efficient your actions are. What tends to happen when this goes wrong is that players get stuck in play-patterns because they play what feels good, and if what feels good is not efficient you do not realize when your opponent gains tempo advantage. When it comes to efficiency you need to include the click spent to draw the card in your evaluation. Why? Well, the basic action we compare against is clicking for a credit. Thus drawing and playing Sure Gamble nets you 2 credits per click, and is twice as good (plus deck-access). Sure Gamble can have a higher tactical value than that, since you can compress your gain to get those 4 credits for one click, but that is somethign we handle in the tactical deep dive. If you play economy for their tactical value you will quickly fall behind someone who plays efficiently. Let’s look at an example, we will compare Sure Gamble to Liberated Accounts. Sure Gamble gives the runner 4 credits. Liberated accounts gives 10 credits. Magnus Opus gives infinite credits. Obviously this is wrong. Let’s do the math. All are better than your basic action, but in different ways. Playing Sure Gamble costs you one click, but you also spent one click drawing it. This means you got two credits per click, total four. Double efficiency of your basic action, and the cardslot gave you two uses of this ‘power’. Credit efficiency: 4/2 = 2 credits per click. Playing and using Liberated accounts gives you 10 credits, costs you 6 clicks. This is ~1,67 credits per click. Worse than Sure Gamble. However, the cardslot gave you 6 uses of this ‘power’ once used to completion. In total this gives you access to more of the ‘efficient credits’. Credit efficiency: 10/6 = 1,67 credits per click. Playing and using Magnus Opus gives you infinite credits for infinite clicks. Whoa! Isn’t this incredible? Infinite access to efficient credits. Well it would be, if games were of infinite length, but they are not. The gain from Magnus Opus entirely depends on how much you use it, as it costs 5 to install. Credit efficiency: .. ? Greatly dependent on how many times you will use it. All these cards are actively considered good cards. They cost the same to play roughly (5, 6 and 5). What is going on here? Why would I ever use the card with the lower total (Sure Gamble)? Apart from deck access there is also the tempo loss to consider. Let us look a bit more closely. Each card is drawn and played below, and when the effect is over the player simply clicks for credits. It is clear that playing a Magnus Opus puts you temporarily in a worse position and it takes time to recover from that. You can also not that Liberated Accounts is worse than Sure Gamble up until the last click. In fact, Magnum Opus ties with basic action on click 9, with Sure Gamble on click 12 and ties with Liberated Accounts on click 14.That is a high cost to pay for permanent access to efficient economy. This means that only if you believe that you will have time to use the Magnus Opus 10 times (12 clicks) and do not suffer from the massive tempo disadvantage during that time should you play it. The lesson we learn from this is that all good economy is a trade-off with tempo and that you are only allowed to feel good clicking that Opus after your 12:th click! Before that you should feel bad. And that is if the deck access and the tempo you lost doing it was worth nothing to you. Now, I’m not trying to bash Opus here. I am trying to state a point, in fact several. Realize the power of the basic action. Be mindful that you do correctly evaluate the efficiency of your actions in every moment. Make a conscious choice that the tempo you are giving up will result in you gaining back the tempo advantage before the game is over. The fact that your opponent manages to score out a Nisei Mk II might not be due to the ICE they installed, it might be because you installed Opus two turns earlier. See the matrix. Think with portals. Properly evaluate your efficiency. One of these depend greatly on the current turn, and the other depend on how long you expect the game to continue for. This makes installing long-term economy both a strategic and a tactical decision. More about this in upcoming articles. Finally, as a Runner, while you make sure that you gain credits in an efficient way you also need to spend them efficiently. Efficiency carries over into making runs and trashing cards. This gets even more complex as things like bad publicity can change the math and so called run economy can even make runs into comparable click economy on sufficiently porous servers. I consider spending credits to make runs a tactical decision, thus we will spend more time on this in an upcoming article. 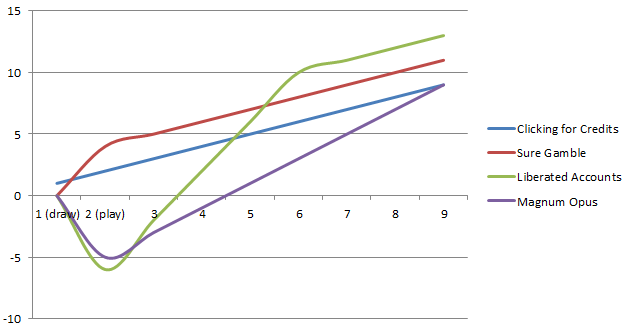 With perfect knowledge (rezzed ICE) you can usually calculate the cost of a run, and when attempting one against unrezzed ICE you must consider if you are willing to accept the maximum cost (making good guesses on the ICE that could be in front of you. A failed run where you spend a lot of credits is very bad efficiency. Thus you need to make sure to avoid this unless absolutely necessary. As a corp you also need to consider the efficiency when rezzing ICE. Usually it is always good for efficiency to rez ICE, as the runner will eventually spend more than you do getting through it. The downside is that it may cost you tempo which we will deal with in the article about tactical choices. ICE that has a facecheck-penalty always costs the runner something, which is massively beneficial for getting something out of that loss of tempo. When selecting ICE to put into your deck you shopuld consider the statistics of it versus the most common breakers and make sure you have some stuff that is cheap (helps you early), some that is expensive (slot efficient) and some that is difficult for all common runners. 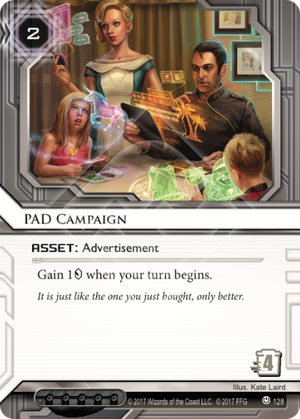 We have defined the parts that go into the Netrunner economy, we have looked at the basic economy of Netrunner and how your deck improves on it. There are three main types: burst, click and drip-economy. We have learned how to evaluate the efficiency of basic moves and the advantages and downsides of each. Economy cards are evaluated on credit efficiency, slot efficiency and type. This prepares us for discussing deck-construction as well. We have learned that you usually should avoid clicking for credits, but sometimes that it is the best option. Learn when to click for credits.